Home - RAK Properties/RAK Investments, Inc.
$750/month 3 bed/1 bath Ranch-style home, 1 mile from I-35 and minutes from Downtown OKC! RAK Properties/RAK Investments Inc. began in 1991 and has grown substantially in our 21 years. We are locally owned and operated. Our company is known for its high A+ rating with the Better Business Bureau of Oklahoma and we are also member of the OKC Chamber of Commerce. A majority of our homes are located in the Oklahoma City Metro Area, as well as the Mid-Del Area, Edmond, Yukon and Mustang. We are proud and excited to announce that we have recently expanded into the Florida area. We have exquisite, top of the line condominiums in South Beach. 95% of our homes have been remodeled. Our remodels produce stunning results (See photos) from granite counter tops, to decorative tile back splash in both kitchen and lavatory, as well as pedestal style sinks in the lavatories. Most all of our homes have hardwood flooring, and or ceramic tile floors. Our homes are TOP OF THE LINE. We do accept Section 8 vouchers on a variety of our homes, and each available listing will notate if we are able to accept vouchers on that particular home. I signed a 6 month lease with RAK for a property in Miami Beach and must say I was a little nervous about them being located in Oklahoma City but it could not have gone better. When I encountered a maintenance problem and contacted Jenny from RAK, she was quick to reply and get the issue resolved immediately and to my complete satisfaction. I will be looking for another rental in September and will be looking to them first. I highly recommend this company! I like to personally thank RAK Properties, they are Awesome in everyway in regards to the service that they provide to their residents. Great staff that are here to provide you fast and courteous service. If you don't want slum lords, get with the best RAK Properties! RAK is great when looking for a nice home. We are here to take your call 24 hours a day, 7 days a week! Directions to our office: From I-44, Exit Pennsylvania Ave., Go South on Pennsylvania to N.W. 39th Street, Go Right at the light on N.W. 39th about 4 Blocks, we are on your right (North) side of the road. 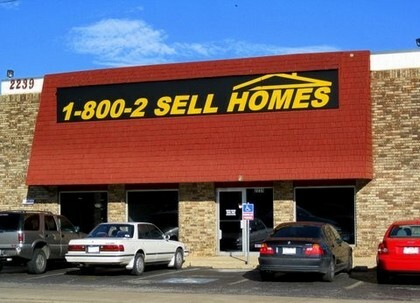 We are located inside a 2 story brick building witha large sign that says 1-800-2-SellHomes.